UK Chancellor Gordon Brown has just returned from a whirlwind trip around China, and BBC business correspondent Nils Blythe, who travelled with him, reflects on what they saw. It's often a detail or throw-away line which leaves the most lasting impression. 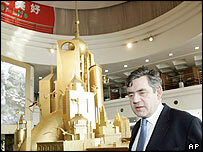 One such detail - rather improbably - came from a presentation to Gordon Brown about Shanghai's plans for a world trade fair, Expo 2010. It was mentioned, almost in passing, that in the next five years Shanghai expects to build 300 new hotels. Now let's just think about that. Shanghai hotels are not modest affairs. Typically they have vast marble-lined lobbies, many hundreds of rooms and 24-hour everything. Nor is there any obvious lack of choice at the moment. So the belief that Shanghai will need 300 new hotels in the next five years gives an idea of the scale of China's ambition. When I was last in Shanghai, five years ago, a property consultant warned me that the city was in the midst of a crazy, speculative building boom. Many of the skyscrapers being built would never find tenants, he said. Even in the intervening five years the city skyline has been transformed by a new batch of huge structures. Many of the newest buildings look as if they have been transferred from the set of 'Blade Runner'. And to add to the sci-fi feel there's the magnetic railway which reaches a speed of 270 miles per hour on the seven minute journey from the city centre to the airport. Where is the other China? Gordon Brown believes that China will ultimately become the world's largest economy and he was there to see for himself what's going on. But the trouble with a three-day, three-city official tour (apart from the jetlag) is that your experiences are very limited. There are endless formal presentations in government buildings, tours of showpiece factories and stage-managed meetings with smiling schoolchildren. No problem with traffic jams. The traffic is stopped so that the official motorcade can sweep through. 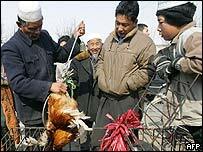 And there is, of course, another China which Gordon Brown and the privileged passengers of the motorcade never caught sight of. One study found that 600 million people in China survive on less than about two dollars a day. Almost all of them live in country areas which are a world away from Shanghai's skyscrapers and magnetic railway. The closest we came to the 'other' China was talking to factory workers in Shenzhen - a huge industrial City where 95% of the population come from other parts of the country and the average age is 28. The Chinese New Year holiday had just finished. It's the only time when most factory workers go back to their families. 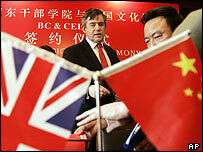 And Gordon Brown's stock question was 'how far have you travelled?'. Those who had only spent eight hours on the train were the lucky ones. All of the production workers said that most of their pay packets were sent home. And so it goes. The labourers who will build the 300 new hotels in Shanghai and the dormitory-dwelling factory workers of Shenzhen send money to far away villages. And the Chinese economy marches forward at remarkable speed. Gordon Brown and the journalists who travelled with him have glimpsed one of the century's most important stories. But it was only a glimpse. Like the old joke about the Chinese meal, a short visit to China soon leaves you hungry for more.